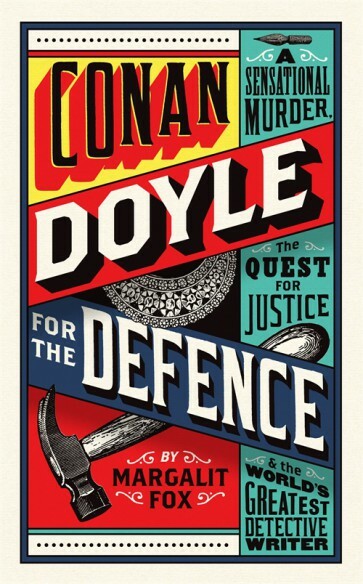 We've been following the progress and the reviews of 'Conan Doyle for the Defence' by Margalit Fox – which involves a sensational murder, the quest for justice and the World's greatest Detective Writer - Sir Arthur Conan Doyle. Margalit Fox takes us step by step inside Conan Doyle’s investigative process and illuminates a murder mystery that is also a morality play for our time—a story of ethnic, religious, and anti-immigrant bias. This is a review from The Guardian. "A few days before Christmas 1908 an elderly woman whom no one liked was bludgeoned to death in her smart Glasgow flat. Within hours a man whom no one liked either was identified as her killer and, in due course, condemned to hang. The Oscar Slater case is often invoked as an example of how easy it was for the police to fit someone up in an age before DNA, when crime scene protocol mostly consisted of slapping handcuffs on the nearest wrong ’un. But its broader message is perhaps: if you want to stay alive, it helps if people like you. This was something that Slater, whose death sentence was changed to life imprisonment at the last moment, never completely understood. It was not, of course, his fault that, as a German Jew, he fell into two suspect categories. The German part was problematic at a time of increasingly noisy nationalism, but the Jewish part spoke to older, deeper fears about what happens when national identities shake loose. The Jews were wanderers who belonged everywhere and nowhere, and the fact that within five days of the murder Slater had vanished to New York made him seem particularly slippery. There were other things too about the 36-year-old that suggested text book degeneracy: he lived with a prostitute, made money by gambling and was known to visit pawn shops. Indeed, a silver brooch that he had recently pledged bore a resemblance to a piece of jewellery that had gone missing during the attack on Miss Gilchrist. But Slater’s really unpopular act was, on his release, to quarrel with Sir Arthur Conan Doyle, the Scottish Irish Catholic jobbing doctor who had done such a sterling job of turning himself into the greatest living Englishman. Doyle wasn’t revered simply for creating the world-conquering detective Sherlock Holmes, but also because he had recently begun to concern himself with real-life miscarriages of justice. For 18 years he threw his considerable moral bulk behind a campaign to get Slater released from Peterhead prison, whereupon the newly freed Slater turned around and refused to behave with the proper gratitude of a good immigrant. In particular he didn’t see why he should reimburse Doyle’s expenses out of his meagre state compensation. Then, even worse, Slater went into print to argue his case and the result was the kind of public slanging match with Doyle that reads as if it belongs in the age of Twitter. There have been more books, newspaper articles and TV documentaries about Doyle’s involvement in the Slater affair than you can shake a cherrywood pipe at. Margalit Fox’s take on the whole business is that the case could only have unfolded in the way it did because it was uniquely hinged between two different ways of seeing the criminal world. On the one hand, she suggests, Slater was a victim of the late Victorian pseudoscience of “criminological anthropology”, which harnessed dodgy eugenics to prove that criminals are born not made. You only had to look at a man’s shifty eyes, weak mouth and, perhaps most significant at a time of rising antisemitism, big nose, to know that he was on the point of doing something very bad indeed. Slater’s mucky private life and broken English was all that was needed to convince the local police that he was exactly the sort of man who would break into an old lady’s home and bash her to death. Against this Fox shows the new system of forensic science, as typified by Doyle’s great creation Sherlock Holmes. This way of proceeding required a close reading of present effects – or clues – from which to work meticulously back to the original event, oblivious to the distraction of noisy generalisations. Fox argues that this is what Doyle did in the Slater affair although, to be honest, the flaws in the police case are so blindingly obvious that even Dr Watson would have smelled a rat. Within a few days of Gilchrist’s murder it became clear that Slater’s pawn ticket did not relate to the stolen brooch, that his trip to New York had been planned weeks earlier and that he bore no resemblance to the man seen fleeing the flat. Put simply, the police were fitting Slater up, quite possibly to cover for the real murderer who was rumoured to be a member of Gilchrist’s own family. Fox, who is a New York Times journalist, has worked hard to reshape a classic Edwardian murder case to make it fit with our times. In particular, she wants us to see that the racialisation of crime is nothing new: bad science and economic insecurity have long been responsible for creating “out groups” on whom we dump our worst terrors. Indeed, the single most chilling moment in her book comes right at the end when she tells us what happened to Slater’s sisters in Silesia, Germany, who had been loyal correspondents throughout his imprisonment in Scotland. In 1942 the now elderly Phemie and Malchin were rounded up by the Nazis and sent to Treblinka and Terezín. Unlike their brother, they had no hope of release."